The National Union of Somali Journalists (NUSOJ) was set up in August 2002 as an association called Somali Journalists Network (SOJON) to promote and protect freedom of the press and the interests of journalists after the former Transitional National Government of Somalia prepared and approved a repressive media law. In order to effectively fight for journalists’ pay and conditions, their working rights and their professional freedom, the members of the organisation in their 2005 General Assembly in Mogadishu resolved to transform the organisation from an Association to a Labor Union with a new Name: the National Union of Somali Journalists. The organization was formally dedicated for the purpose of serving the member journalists’ interests and needs with respect to journalists’ rights, press freedom and working conditions. The National Union of Somali Journalists is a national labor union representing over 500 of Somalia’s 700 journalists, who established or joined the union in order to uphold and defend their interests, needs and rights cooperatively and deal with employers, authorities and other sectors in the society collectively. 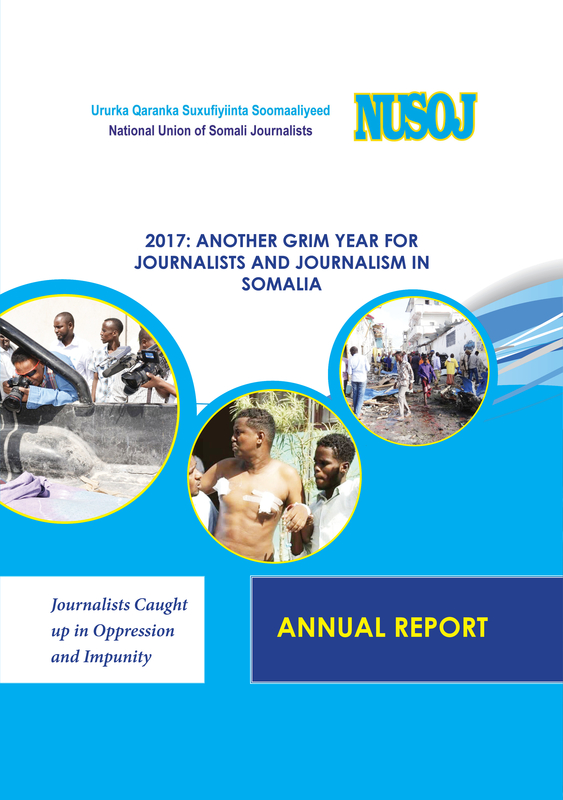 NUSOJ is a fervent champion for media freedom, the rights of journalists, workers’ rights and for social justice in Somalia. Member journalists work across the whole industry as reporters, editors and sub-editors and photographers. Members work in broadcasting, newspapers, magazines, and in the new media (news websites). We are professionals and are proud of the work that we do. Our members come from many different families and backgrounds, with widely different regions. The National Union of Somali Journalists systematically monitors and conducts investigations into violations of press freedom and human rights of journalists. We provide accurate, prompt and impartial information concerning attacks on journalists such as killings, arrests, death threats and harassments, as well as acts of aggression against media organizations. We generate and rally a national and global community of press freedom defenders and trade unions to take effective action against press freedom violations and labour rights abuses. We provide a constant stream of information to the local media, foreign press, local authorities, members of international community, and inter-governmental organizations, urging them to take action where press freedom infringements are happening. We monitor and investigate cases of violations objectively and independently. We ensure national coverage on press freedom and labor issues. We organize national acts of solidarity with victimized journalists, media professionals at risk or the families of mistreated journalists. We lobby at various levels, targeting local media, local authorities, government and the international community, calling for them to respect, protect and promote media freedom, journalists’ rights and to improve unfair policies and programs. We create a clear position on issues of concern, not only to our members, but to all concerned groups who are interested or involved in what we stand for. As part of the union’s commitment to promote high standards in media and journalism, NUSOJ strengthens the professional competence and ethical standards of both established journalists and new entrants in order for them to be qualified journalists adhering to high professional standards. We have organised and continue to arrange workshops, seminars, roundtables and debates on the profession with the ultimate aim of strengthening the freedom of opinion and the freedom of the press and thus improving the conditions for democratisation, peace building, reconciliation and social and economic development in Somalia. NUSOJ was founded and is governed by our member journalists. We are a democratic union, and our strength comes from the involvement and engagement of all our members. It is possible for all members to influence policy. The Union’s policy, objectives and priorities are decided at the General Assembly, which meets once in every three years. Six Branches of the union are entitled to send delegates to the General Assembly in proportion to the size of their membership. Policies and programs developed by the elected members are implemented and administered by the National Secretariat. NUSOJ is governed by a Supreme Council, responsible for the general policies between General Assemblies, and an Executive Committee, in charge for the administration of the Union. The diversity of the union’s membership also is one of its strengths. NUSOJ is pitilessly opposed to discrimination and prejudice, on grounds of gender, tribe/clan, age or disability, not least because it divides rather than unites. 1. Protect and Promote Freedom of the Press, Speech and Information. 2. Improve working conditions and safety & security of journalists. 3. Defend and promote principles and practice of the journalistic profession. Internationally, NUSOJ is a full affiliate of the International Federation of Journalists (IFJ). It is affiliated to the International Freedom of Expression eXchange (IFEX) and is the Somali partner organisation of Reporters without Borders (RSF). Nationally, NUSOJ is a member of Federation of Somali Trade Unions (FESTU) and the Somali Forum for Freedom of Express (SOFFE). The National Union of Somali Journalists (NUSOJ) has won prestigious international awards in recognition of its tenacious fight to defend the international principle of press freedom in Somalia. The Paris-based international media freedom watchdog Reporters Without Borders (RWB) awarded NUSOJ the Fondation de France International Press Freedom Defender prize in 2005. The U.S. National Association of Black Journalists (NABJ) honored the National Union of Somali Journalists (NUSOJ) in August 2007 with its Coveted Annual Percy Qoboza Foreign Journalist Award for defending press freedom. The National Union of Somali Journalists (NUSOJ) received in April 2008 the Democracy Courage Award on behalf of Somali journalists from the World Movement for Democracy (WMD). The World Movement for Democracy (WMD) held its fifth assembly in Kiev, Ukraine, from April 6 to 9, 2008. It is a global network of democrats including independent journalists, trade unionists, business leaders, religious leaders, human rights activists, practitioners and academics. NUSOJ received the French Republic’s liberty, equality, fraternity human rights prize awarded by the Commission nationale consultative des droits de l’homme in France on 10 December 2009. According to the statement released by the French Government through its embassy in Nairobi, the Commission nationale consultative des droits de l’homme (CNCDH) awarded the NUSOJ the prize, “a special distinction, in recognition of the work the union has been doing in encouraging freedom of speech, and defending and enhancing media freedom and human rights in Somalia”.